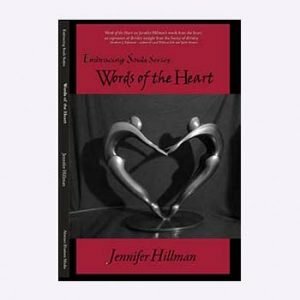 Words of the Heart is the second in the poetry series, Embracing Souls by Jennifer Hillman. Poetry is often the expression of love, of angst, of splendor, of the divine wisdom. Like the separation between self and spirit, source, the universe, it is only the limitation of the mind that end or begins with each breath of reflection. Words of the Heart is the continuing journey through Jennifer Hillman’s poetry as she lives and becomes more aware of the values of the lessons she learns along the way. Her connection with the Divine is through the expression of relationships, near and far. The mysteries of life are only deepened and add more curious questions with each interaction with the soul mates on her journey. The lines blur the more open she becomes and embraces her creations and experiences. When reading poetry like Jennifer Hillman writes, it’s difficult to put a description of it into words. Her verses are like a softly spoken voice; they feel almost like a light breeze does on my skin. Yet there is nothing fragile about this voice. On the contrary, beneath the sensitivity is a powerful voice. One of wisdom, grace and strength. A visionary. A voice that can reach out and touch souls. Sooth. Uplift. Guide. This is poetry that speaks the language of emotion, reaching down to the very core of essential being. If Love had a language, it would be “Words of the Heart”.